British police officers are in Israel to investigate the use of fake British passports by suspects in the killing of a Hamas leader in Dubai. They will interview six British-Israeli nationals whose identities were stolen by the suspected killers. The officers said the men were being treated as potential witnesses to a crime and not as suspects. It is widely believed Israel's secret service, Mossad, killed Mahmoud al-Mabouh in a Dubai hotel last month. Israel has declined to confirm or deny that it was responsible. Officers from the UK's Serious Organised Crime Agency (Soca) are investigating the use of the fake British passports. It said the meetings with the six British-Israeli nationals were taking place with the full knowledge of the Israeli authorities. "We are arranging to speak to the six genuine passport holders who are resident in Israel as potential witnesses to a crime," a Soca spokesman said. "Those meetings will take place in the British embassy." 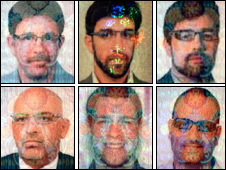 Earlier this month, the Dubai authorities released the names and passport photographs of 11 members of the alleged hit squad. 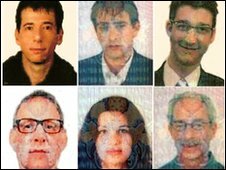 They had used European passports, including six UK passports bearing the names of British-Israelis. They are James Leonard Clarke, Stephen Daniel Hodes, Paul John Keeley, Michael Lawrence Barney, Jonathan Lewis Graham and Melvyn Adam Mildiner. They are to be given new passports by the British embassy. However, police in the Gulf state have now said they are seeking 26 "agents" in connection with the assassination of the Palestinian militant. They said 12 of the suspects had British passports, six had Irish passports, four had French, three had Australian and one had a German passport. The Soca spokesman said the agency anticipated similar meetings taking place with the second set of six passport holders. Soca has a network of 140 international law enforcement officers stationed in 40 countries around the world. The use of the European and Australian passports in the assassination has sparked a diplomatic row between those countries and Israel. One of the founders of Hamas's military wing, Mr Mabhouh was found dead in a hotel room on 20 January. A post-mortem examination report said he had been electrocuted and then suffocated. Reports said he was in Dubai to buy weapons for Hamas. Why did Hamas man go to Dubai? Is Dubai murder an own goal for Israel?